There is no doubt that the ICP was, for a long time, the only legal party in Israel to stand up to the racist Zionist attacks on Arab Israelis. However it did much harm by tying the fortune of Israel’s Arabs to that of the Soviet Union. That is why radical nationalist groups like Balad to its left, have supplanted it. The CP has often been timid and lukewarm. It endorsed the creation of the Israeli state and the Declaration of Independence, knowing full well what this meant. It accepted in essence the Zionist goal of a Jewish state and not only in Israel of course, but at the behest of Stalin in the Arab countries. Nothing undermined the CPs, the major left group, in places like Iraq that the decision to support the creation of the Israeli state. Indeed it was a catastrophe for the Arab left. The CPs support for a 2 States position today, when such a demand is meaningless outside a glorified version of an Indian reservation is almost as bad. It can only reinforce the position of the present PA leadership under Abbas, with which the ICP does have strong relations. The PA of course is an almost wholly US-Israeli sponsored entity. That is why it is so disgraceful that the ICP marched in unison with Zionist parties such as Kadimah to call for a 2 State solution. The ICP knows full well that Tsipi Livni, Kadimah leader, openly calls for the transfer of Israeli Arabs into a Palestinian statelet as part of a readjustment of borders (i.e. hiving off the parts of Israel in which Arabs predominate). It is a thoroughly racist solution whose aim is to preserve the Jewish demographic majority in Israel. The ICP artificially divides regimes into pro and anti-imperialist, without looking at their substance and then characterises the heroic struggles that are taking place as pro-imperialist, as if Assad and his father were ever anti-imperialists. Assad’s Syria is a vicious police state, and Hafez Assad, Bashir’s father invaded Lebanon in 1976 precisely in order to prevent the victory of the Palestinians and Left against the Phalange. It did this with Israel’s blessing. The Assad regime is no friend of the Left or the Palestinians. The ICP, which is a thoroughly Stalinist party, is saying it has no confidence in the Syrian Ba’athists and is content to rely on a regime that is as corrupt and brutal as any other Arab regime on the grounds that its alliance with Iran annoys Israel and the USA. But both the latter have deliberately not called for the overthrow of Assad. Imperialism fears the masses as much as the Israeli CP. Socialism is about power being taken by and for the people, economic and political. Mowing down demonstrators with gun fire should be equally condemned whether it is in Bahrain, Egypt or Damascus. The ICP’s condemnation is mealy mouthed and it contrasts the resistance to the oppressor and likewise equates the massive military force at Assad’s disposal with the puny reaction to it. I copy below an article from Challenge magazine. 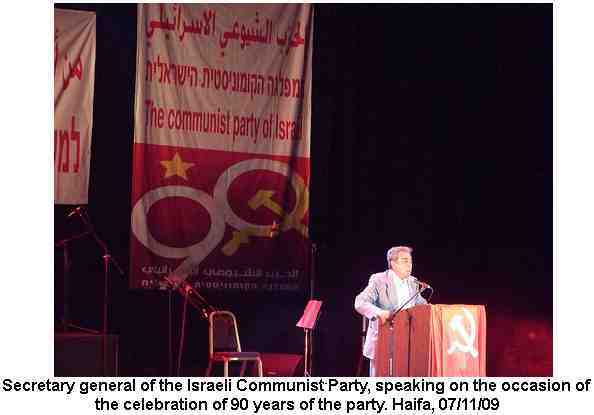 The following article was originally written in Arabic as a response to Muhammad Nafa'a, the General Secretary of the Communist Party in Israel (MAKI). We offer it in English because it gives an important insight into the political and ideological discussions regarding the Arab Spring. Nafa'a has been publicly supporting the Assad regime against the popular uprising in Syria. So have 50 other communist parties. This article proposes an alternative socialist position. We have not forgotten that in 1976, Hafez Assad, Bashar's father, invaded the refugee camps in Lebanon with full Israeli coordination, to suppress Palestinian resistance. We have not forgotten how Bashar himself, “hero” of the resistance, did not respond to the Israeli aircraft flying over his palace or to the bombing of the nuclear plant, just as he accepted the occupation of the Golan Heights. Bashar’s declarations that he is willing to negotiate with Israel should not surprise anyone. He will not hesitate to throw himself into America’s arms to enable his middle class to flourish and become ever wealthier. 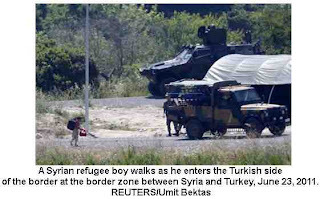 This is exactly what happened in Egypt after it adopted the policy of “infitah” – openness to the West. Socialism, in the Marxist sense, is based on democracy and favors a multi-party system. Historical circumstances led the Soviet Communist Party to adopt a dictatorial regime, especially the isolation and numerical weakness of the working class vis-à-vis the peasants after the revolution. Is this enough to justify the dictatorial regime of a single party once it has proved its failure? 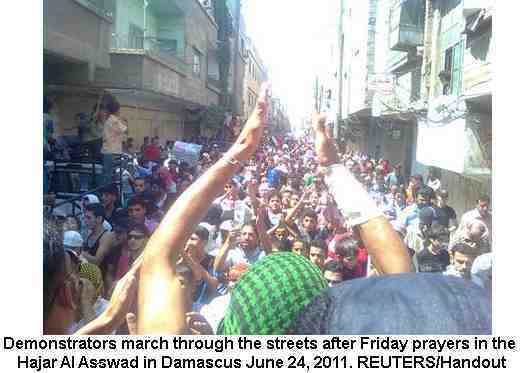 After all, a one-party dictatorship is exactly what brought the Arab people out onto the streets to protest. These revolutionary uprisings could have been a golden opportunity for Israel's Communist Party, Maki, to reexamine its antiquated position on dictatorship. However, under Nafa’a, we see no signs of new thinking. The Syrian uprising is the most difficult test. It requires that the Arab Left rethink its path and abandon the option of Iranian and Islamic resistance, which has dominated Arab political discourse, including the Left's, during the last twenty years. The Left must roll up its sleeves and rebuild its forces, and shake off the dust of cynicism and despair. 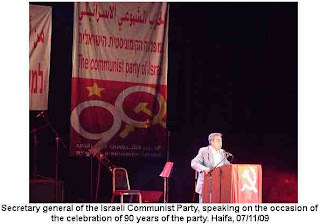 The Communist Party was always a joke in Israel, as it attracted mostly Jewish Zombies who wanted Israel to be as the USSR dream lala land, all the others were Muslim Israelies, that the connection between them and communist party was only because of the national issue, nothing else, they were hell of Capitalists, but joined the party because of the anti Zionist issue. Matzpen was the biggest joke and the outcome is your good friend Gilad Atzmon, his parents raised this bozo as the next generation "soldier" of the radical militant communism. There is some truth Gidi in what you say but Rakah/Khadesh or whatever it calls itself now was the only organisation from 48 onwards to resist the military rule and oppose the attacks on Israel's Arabs. Agreed that Arabs joined it because of its opposition to Zionism (in fact it isn't opposed to Zionism but is non-Zionist) not its anti-capitalism. Don't accept that Atzmon was the product of Matzpen, which gave birth to a generation of Israeli anti-Zionists. Atzmon's parents were Revisionist Zionists and his dad a member of Irgun. That is where he got his racism, only he twisted it around a big to target Jews rather than Arabs. I don't know where the hell you are getting your information from, as you always write as you are so sure about what you are talking about. Most of you are realy Ignorant and base your knowledge of what you choose to read. where did u get your stupid story about Atzmon. You buy everything he writes don't you. Read some writings of his mother Ariella, you are funny. if this is a way Zionist write, well guess you think you know everything , you are a scholar from the uk. I was there I know, All the old time commies know this story, so what's your game. All the communist parties are anti Zionist, the more radical the more anti. "Atzmon's parents were Revisionist Zionists"
it is actually the Jews that perpetuated themselves as a racial 'blood community'. The Jewish Israeli lobby's success in the Bush administration verifies it as such. This is just one example. Right from the beginning, Zionist settling was marked by 'tower and stockade' as the manifestation of an accomplished fact. The Zionist call for the REDEMPTION of the lands of Palestine was an aggressive abuse of a HOMECOMING. Lands belong to those who dwell there, therefore the use of the word REDEMPTION was vicious from the beginning. Redemption from what? From whom? Under the slogan of ”making the desert bloom” Zionism defined the place as a desert and thus completely ignored the villages, towns and the people already living there. Jewish Zionists defend their colonization of Palestine by pointing at those dark chapters of other nations' history. They remind us of the atrocities against the American Indians, or the wrongs done to the Australian Aborigines. True, to colonize a land, killing and shunning its indigenous inhabitants is evil, but to return to what is claimed as one's homeland lacking the ”care of homecoming” is a unique historical heartless and shameless phenomenon. In their fanatical enthusiasm to build a European spot in the heart of the Middle East they were determined to vandalize the landscape bringing into reality the apocalyptic verse: "the rugged shall be made level". For two thousand years "sat the Jews, by the rivers of Babylon, where they wept remembering Zion", but it took them only 50 years to turn Zion into a polluted place, where the rivers are poisoned with industrial filth and the seashores are contaminated by sewage. A land where the old Holy city of Jerusalem is a wretched place deprived of municipal services and the new city is crowded with beggars, messianic lunatics, and poor ultra-orthodox living on charity, as if the old European ghetto had been transported to the heart of the Judea's mountains. When the first pioneers the 'HALUTZIM' disembarked on the seashores of Jaffa they zealously compared their homeland to a beloved woman whom they promise to clothe with a dress of asphalt concrete and mortar. This drive to bury the Terra Sancta under a coat of concrete, to bulldoze and crack its mountains, to construct separation walls and to offend their next-door neighbors, manifests gross insensitivity regarding a homeland as a 'gift' that should be treated with com-passion. A belongingness to a homeland denotes responsibility and commitment to its history, and not the other way round. People who are oblivious to the idea that a homeland is a gift of destiny do not deserve the gift. The Jewish occupation of Palestine is distinguished from all other White Man colonization, since apart from indifference to the place and its inhabitants, it epitomizes an oblivious attitude to their own History. The Zionists imagined Zion as a place where they will feel ”at home” and thereby fulfill their destiny. They thought of cultivating it and turning it back into the land of Milk and Honey, but at the same time they lacked any knowledge about the place and its inhabitants. Right from the beginning, there was no intention of dwelling. Israeli Jews queuing at the doors of the Polish, Estonian and the Lithuanian Embassies begging for an EU passport, do they have the intention to dwell? The old role of the Wandering Jew being dispersed among the gentiles is still being played out awaiting those who do not dwell. As for all communist parties being anti-Zionist, not so. All the communist parties in 1947 supported creating the Israeli state as a Jewish state. I am not aware and not interested in this person Atzmon grandfather, I am talking about his Mother. read his and her article and see the similarity . He was raised to follow, that's why he is a Psycho case. Regarding the communist party, as you know the USSR was sure Israel is going to be a communist state, as most of the eastern block, that's why they instructed the communist party to support the creation, once the reality changed, they went anti Zionist. I am amazed of your ignorance. you should try not to be so arrogant given your own knowledge is so slight. You may not be interested in Atzmon's grandfather but I am. And more to the point it is Atzmon who cites his grandfather as being an important part of his development. A member of the fascist Irgun Zvai Leumi. His mother is of no interest to me, other than that she developed his impenetrably dense prose masquerading as philosophy. Nor am I at all sure that Stalin believed Israel would turn communist. If he did then that shows the idiocy and stupidity of Stalinism, on a part with its pact with Hitler and its belief that Russia could be part of the pact with Italy, Japan and Germany. Stalin's purpose was different. To get British imperialism out of the Middle East and to use Zionism as the means. As we all know US imperialism replaced it and was, of course, far worse. Am I arrogant? guess you never read your comments. Well his grandpa can be another Atzmon story, as he made up stories about his Army been a Medic (played sax in the airforce band), it means he never been a rebel as those who refuse to go to the army, his stupid story about the "light" he saw in Lebanon, is as stupid as he is, as he was there maybe one day to play with the orchestra, as a tourist and what he saw is less then what he could have seen in any other camp. then after the army he used to play with the most Zionist singers, playing the most Zionist songs and then Klezmer music with a religious Dou. he never made it in Israel and even trying to be the king of klezmer music didn't work for him he was bitten again and again by Giora Fideman. His grandpa could have another name and as Atzmon is the biggest liar, this is another fabrication. BTW he mentioned that his parents were also Zionist. well his mother, works for the ministry of education and the Heb university. she never ever publish any anti Zionist nor anti Jewish article in Israel, only in English and out side of Israel, as she cared about her career (what a rebel) same as her son. if you did not get yet, 90% of his mania is to get publicity and push his Music low career. Stalin was sure Israel is going to be a USSR base, a looney as all the others communist . As I grew up from this scene (guess you never had), its a Toxicated Addiction been a rebel especially a left rebel. My only comment is that much of this is interesting but Stalinism and Communism were not the same thing. Stalinism was the antithesis of communism with its personal dictatorship. It's no accident that in the purges, Stalin eliminated virtually all of the old Bolsheviks. Stalin's about turn, which was opposed most vehemenly by the Jewish members of the Iraqi CP, which at the time was very strong, helped destroy the influence of the CP in the Arab world. Utterly criminal. This is a long discussion, see that every place were communism came into practise it always completely failed (removed) or you find excuses why and how its a antithesis you name it. I guess its a jewish phenomena, as thier condition was mostly bad, they always adopted or were Attracted to everything that can change thier situation. I recall my uncle that risked his life to hang the red flag when the russians chased the germans away, he was a "burned communist" in his older life just raising the word made him loose his temper. The only place where I think it worked for a short time were the Israeli Kibutz, but it melted in 2 generations. It will remain a western Intelectual caffe theory discussion and a dream of young people who think there is a better way untill they join the real life. As I mentioned I grew up I don't even meet those people anymore. Given the failures of capitalism, there is no need to justify the failure to achieve socialism or communism. But the latter has to be distinguished from Stalinism which clearly had nothing to do with either. As far as the Kibbutzim are concerned they were never socialist. They were stockade and watchtower settlements and they were the advanced guard of the JNF and the Jewish Agency's Land Settlement Division under Josef Weitz. They were also racially exclusive communities and Arabs were barred from membership. The beginning of the Kibutz movement in the early days, were an experiment to experience socialism as written in the book. Those who came from Russia were so disappointed from the socialism in Russia that were obsessed to have the REAL Socialism, as those were young intellectuals they took it even to the extreme . What the hell are you talking about, sure it had to do with guard of the JNF, as they were attacked stupid, there was not a state your british imperialist did not give a damn about them so they had to protect themselves. Regarding the issue of "racially exclusive communities and Arabs were barred from membership" how can I not be arrogant as you are so ignorant, as what kind of situation are you talking about, it was a stage of war between the two (again I am talking before the creation of Israel in all my comments) what kind of a stupid argument you raised up. Give me a break........... your brainwashed mind will not give any credit, that's why I left this movement, you are the same example how the human mind can get so narrow and computerised and follow blinded some ideas and leave your basic common sense behind. your anger and frustration shows in you lack of grasp of the facts. Yes a few socialists came from Russia who were disappointed with Soviet style socialism, but what does that suggest? That Zionism turned even the best people. The brainwashing is all yours. There was no war before 1947-8 and certainly not before 1936. In fact the first kvutza, Deganiah, was founded 1908/9. But it settled the land of Arab peasants whom it promptly drove out. Classic colonialism, even for your befuddled racist mind that accepts the eviction of non-Jews. But don't take my word that the Kibbutzim were not experiments in socialism but the kind of collective effort you often see in early settler-colonialism. 'I can say with absolute certainty: those enterprises in Palestine which are most profit bearing for the businessman are almost the least profitable for the national effort and per contra many enterprises, which are least profitable for the businessman are of high national value.' Ruppin; Building Israel, New York 1949 pp. 47, September 1965. Arthur Ruppin was not merely no socialist but a devotee of the racial sciences, who paid a special visit to Professor Hans Gunther, installed by the Nazis as Professor at Jenna University, in the summer of 1933, in order to share ideas about the fitness of Jews racially to create their own state and much else besides. Gunther was the ideological mentor of Himmler no less. Socialist did you say? Try opening your mind and stop parrotting Zionist slogans of no relevance. "what does that suggest? That Zionism turned even the best people." That's your brainwashed head, Who mentioned a suggestion, I gave examples and you run for your stupid conclusions. If I was to suggest something is to show how pathetic communist/socialist/Trotskyst/marxist you name it today are, What's the connection to Zionism at all. Many of those socialist that came from Russia and Europe disappointed with Soviet style socialism after, who wanted to built up a better Socialism, ran back to Europe as they discovered, that been a real Socialist is Beyond sitting in "coffee houses" and discussing ideology as most of you do, but once you have to contribute hard work... that's too much. The area of "Umm Juni" land belonged to the owner of Persian origin bahai. The area was purchased in 1903 by Haim Margolis and then moved to purchased lands of Bab-al-Tum. Your Attempt to show that there was NO war before 1947 and certainly not before 1936 (good that you did now try to gap it more), is nothing but a Pathetic Lie, what are u trying to show, that is was a Happy partnership before those dates. Events of the riots ( 1929 ) were a series of riots violence During a week of events 133 Jews were killed and many wounded. So your argument regarding the "racially exclusive communities and Arabs were barred from membership" is completely foolish, as how can you blame some one of been racial, when you are in constant fight, but again, it is your brainwashed mind. You're beginning to rant Gidi. Use the term 'lie' again and this exchange is terminated. Likewise any other formulation such as 'your brainwashed head'. You're the one who is brainwashed as are all Zionist daleks. Don't make assumptions about me. I'm an activist you are a Zionist supporter of racism in Israel. I didn't say there was no tension, riots, attacks or whatever. I said there is no war. Try getting your head around the difference. Of course the Arabs resisted what they saw as an attempt to begin driving them out. Why else were kibbutzim, these socialist paradises, Jewish only? Since they were racist institutions from the start they could hardly be socialist unless, like Hitler, yhou believe that there is a 'national socialism'. And since you don't get it I'll repeat it. Colonisers never made the indigenous people they were replacing, exploiting, driving out, part of their institutions. Zionism was no different in that respect. Any idiot, even you Gidi, could tell that a Jewish State meant no Arabs or very few. Hence the 'demographic fears' in Israel today of an Arab majority.